EZ Loader offers a huge selection of adjustable, bunk trailers. Bunk trailers offer excellent support with fully adjustable bunks to give your boat the perfect fit. 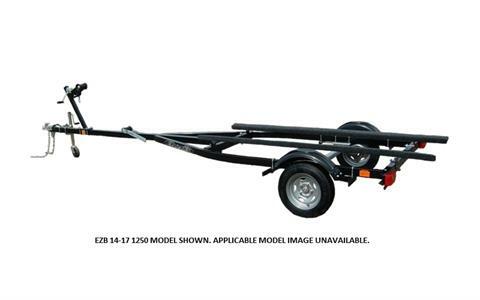 Choose from a variety of EZ Loader Adjustable boat trailer styles and finishes and get to the water with ease. Available in Single, Tandem or Triple Axle Torsion Suspension and Single and Tandem Axle Spring Suspension. VERTICAL LOAD GUIDES – ADJUSTABLE: Bunk or roller vertical load guides – a perfect assist for adverse water & weather conditions. Available on select models. FIXED BUNK EXCHANGE ON Y-FRAME – ADJUSTABLE: Extra boat support for y-frame boat trailer models. Ask your dealer if your model applies. JONBOAT EXCHANGE – ADJUSTABLE: Cross bunk to give extra support for longer bunk jonboats and other flat bottom boats. INBOARD CROSS MEMBER EXCHANGE – ADJUSTABLE: Special recessed cage helps protect your boat’s inboard shaft and propeller during launching and loading.